From an early age children appreciate and enjoy listening to music. Many parents relate stories of the benefits of playing music to babies in the womb. Whether it calms the mum and baby or expands the babies mind it is certainly obvious to any parent that kids just love music. Before children can walk and talk they will happily tap along to a beat. In addition to the calming effects of music on expectant Mums, parents around the world have found their children happier and more able to focus when exposed to a wide variety of musical styles. Many parents these days get their kids started with nursery rhymes or kid’s bands like the Wiggles or Lah Lah's Big Live Band. But what happens when the children get a little bit older? Usually this is when kids get exposed to music that was created with teenagers in mind. Pop music often with suggestive lyrics and video clips that is not really age appropriate. "That's exactly why we created Musical Style Adventures", explains Adam from Stinky Ninja. The Stinky Ninja imagery, lyrics, and storytelling style are aimed at pre-teens that have outgrown music made for kindergarten." 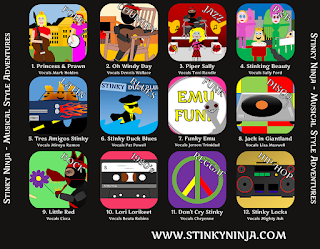 With Stinky Ninja's Musical Style Adventures children have fun and learn about many different musical styles. From Folk music that is fully acoustic right through the decades to Hip-Hop that is fully electronic. Each song is coupled with a funny story and animated video clip that ensures kids have a good time while listening. 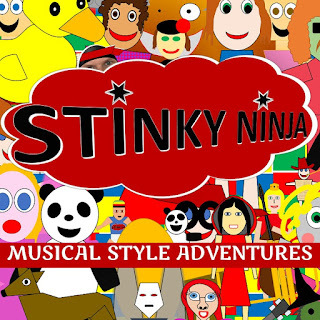 The great thing for parents is that Stinky Ninja isn't just for kids. With authentic music, instrumentation, and arrangements many adults also really enjoy listening.